Recently, word has gotten out and the BVI have been placed front and center on the world’s diving stage. Here, you will surely ﬁnd the diving experience you’ve been wanting. The sheer size of the region makes for a great variety of topography and conditions at our many dive sites. 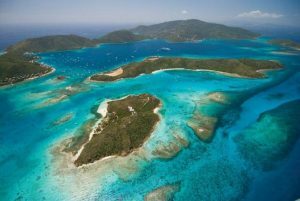 There are 60 sites with dive moorings in the BVI, and we’d love to show you every one of them. Please click on the regions below to see specific site info in that area. The newest site in the BVI! The Kodiak Queen, a former Navy fuel barge, survived the attack on Pearl Harbor. In March 2017, it has become an underwater art installation and the newest dive site in the British Virgin Islands. The Kodiak Queen launched in 1940 as U.S. Navy fuel barge YO-44, and is one of only five ships that survived the Pearl Harbor attack. As the Kodiak Queen, the ship began a new life as a fishing boat. Historian Mike Cochran found the ship rusting in a Road Town junkyard in 2012. He set up a website in an effort to rescue the ship, and got some famous attention. Owen Buggy, a friend of and photographer for Sir Richard Branson, saw the site and suggested the ship as an artificial reef. Only a few months later The Kodiak Queen was brought over from Tortola to be sunk just off the shore of Long Bay in Virgin Gorda. Located to the NE of Mahoe Bay and Mango Bay in the lee of Virgin Gorda peak, this area has three separate moorings. The moorings closer to land are shallower (max 40ft) and are made up of more grottoes, archways and undercut coral heads. A popular dive-site trip from the Yacht Harbour, it makes an excellent 2nd dive after a trip to Ginger or Cooper Island. An oasis in the middle of the ocean ﬂoor, it attracts some of the largest schools and varieties of reef ﬁsh anywhere in the BVI. A submerged pinnacle rising to within 4 ft of the surface, this is a spectacular dive. Proliﬁc sponge and soft corals give the reef tremendous color. Washed with strong currents, this brings in huge volumes of ﬁsh. Voted #1 Wreck in the Caribbean by Sport Diver & Scuba Diving magazines. If you only have time for one dive trip in the BVI, the RMS Rhone is it. Dive BVI has been leading dives to this spectacular wreck since 1975. We currently offer scheduled trips on Tuesday, Wednesday and Friday mornings (2 tanks) from our 3 different locations. We also run a special Saturday afternoon 1 tank/snorkel trip. With advance notice, we can arrange trips for other days. We also offer Night Dives to the RMS Rhone on request. Taking a swim with Tarpon at Scrub Island, BVI! A 2-minute boat ride from Scrub Island, this site is named as a result of a diver losing a diamond ring here about 10 years ago (never found). The reef itself is a small “wall”some 200 yards long. This site is ideal for all levels of divers and snorkelers, accessible in nearly all weather. From the mooring, a wall runs eastward, dropping from 25 ft to 60 ft, with large mushroom-shaped and pillar coral formations, and plenty of soft corals. Look for schools of Creole Wrasse and Blue Chromis, with the occasional large lobster and nurse shark. Located on the NE corner of Scrub Island and so-called because there really are sharks there! Due to the current, which often runs away from the boat, this is an advanced dive, not to be attempted in inclement weather. Located on the south side of Lee Bay, the highlight of this site is the “grotto” found close to the island, in about 20 ft of water, which appears to have been formed by lavaﬂow. In its nooks and crannies are spotted lobsters, banded coral shrimp, and schools of glassy sweepers. Located on the NW tip of Great Camanoe, a profusion of large boulders covered with soft corals, leads to a sandy bottom. Around the point, keep an eye to the open ocean for pelagics. This is an advanced dive due to the current running around the point, away from the boat. Not recommended in the high season due to heavy boat traffic, but in the summer months, this can be an interesting site, teeming with ﬁsh life. In addition to a couple of small caves, there are schools of baitﬁsh, often with mackerel and large tarpon feeding. Off the northern coast of Guana Island, this site is an underwater cavern system. The cavern is very large, with one entrance at 60 ft and another close to the surface. Inside, look out for the occasional turtle or Goliath Grouper. On the eastern point of Brewers Bay, the huge boulders top-side are replicated underwater, creating swim-throughs ﬁlled with baitﬁsh and glassy sweepers. In the summer months, when the fry are thick, tarpon are regular visitors. From the mooring at the Western corner of Brewer’s Bay, you can meander north and west through numerous underwater pinnacles and crevices that, during the summer months, are packed with baitﬁsh, mackerel and tarpon. This is a good spot to look for devil rays as well. One of the most famous dives in the dog islands, the Chimney is a site with an unusual underwater structure. Long told to be a favorite site when Jacques Cousteau was diving here, we can easily see why this site is so popular! Bring a light to best appreciate the incredible colors! A very different dive from others on the Dog Islands, the south side of Great Dog sports a large traditional coral reef. Another feature is the remains of an small inter-island commuter plane originally operated by the now-defunct Atlantic Air BVI. Situated off the west side of tiny Cockroach Island, this area is swept by current and attracts a range of marine life. This is a challenging dive due to the variable and sometimes strong currents, so pay close attention to the dive leaders’ instructions and stay close in the dive group. An excellent 2nd dive of a two-tank trip or afternoon dive, but in the winter months the site can be an impossible feat. An archway leads to a shallow canyon through the reef; on the other side of the canyon, the reef curves to create an amphitheater effect with soft pillar corals in the center. Exposed to the ocean, this can be a very exciting dive. You should keep your camera handy on this one as we often see sharks and rays here! Only available on calm days, this dive is best done in the summer months when the wash rocks attract bait ﬁsh which in turn brings in barracuda, mackerel, bonito and large tarpon. The name comes from the fact that the site is often ‘wall-to-wall’ ﬁsh. Similar to the Visibles, this site is sometimes washed by strong currents and close attention should be paid to the dive leader. You can’t miss Yellowfish Rock at the bottom! Another interesting 2nd dive, this site is best done to view the scenery as it does not have as much marine life as other locations. Nestled up against West Dog, the underwater topography consists of numerous large boulders, some up to 25 ft high. There is a small cavern in the shallows that is often filled with glassy sweepers. Not as popular a site, the Flintstones is named for the rocky outcroppings on the west side of West Dog which are supposed to resemble Fred and Barney’s home of Bedrock. Underwater, the boulders continue, creating numerous ledges and overhangs for ﬁsh and lobsters to hide in. As with Alice, Ginger Steps enjoys some of the healthiest corals in the BVI. The site is further east along Ginger Island, tucked up against the tip of South Bay providing better protection from ocean swells and making for a calmer dive. With many “steps” to explore, divers of all experience levels can enjoy this site. On the north side of Ginger Island, this site is almost always ﬂat calm, providing a restful location for surface interval and second dives. Again, a huge healthy coral reef runs the length of the island starting at about 15 ft and falling away to the sandy bottom at about 60 ft.
A large rock facing the open ocean, this site is open to current ﬂows. A favorite site for schooling sennet, the exposed rock face is often visited by larger pelagics – look out for reef sharks, barracuda and mackerel. Situated off the south shore of Ginger Island, this site provides a very different underwater landscape to other BVI areas. A healthy spur and groove coral reef runs below the dive boat (moored in about 60 ft) and slopes up towards the island to a minimum depth of about 35 ft.
A favorite site with local dive leaders, this dive provides some of the more unusual marine life. The site can also make for a challenging dive due the exposed location and divers should pay close attention to the dive leader if currents are present. Another favorite local site, also only possible on calmer days due to its exposed position up against the eastern shoreline of Cooper Island. This makes for an excellent second dive – especially when paired with Dry Rocks East as a ﬁrst dive. Tucked around the SE corner of Cooper Island, Markoe Point usually enjoys protection from the elements. A v-shaped groove with an overhung lip leads onto the eastern edge of the island where the coastline drops vertically to about 80 ft, offering an imposing underwater vista. Situated South of the Marie L and Pat wrecks, Thumb Rock consists of a giant boulder rising from 60 ft to within 15 ft of the surface. Large schools of creole wrasse gather around the boulder, along with numerous lobster. This is a quadruple wreck site (the Marie L, the Pat, the Beata and the Island Seal). Be sure to look for the large colony of garden eels around the wrecks and the stingrays that frequent the area and which will happily swim through the middle of the dive group. The site gets its name from cistern-like holes in the reef. A great place to look for eels, nurse sharks and tarpon. This site makes for a great second dive on our morning trips. Lots of light and some interesting perspectives for underwater photographers. Based around a pinnacle which barely breaks the surface, this is one of the most colorful dive sites in the area. A huge stand of pillar coral along with abundant marine life provides a memorable dive. Keep an eye out for eels and squid at this site. Due to its remote location, 12 miles NW of Virgin Gorda, this site should only be attempted with experienced instructors and good weather conditions. One of its challenges are the regular swells, in the 3-5ft range. Also, due to the unstable piping inside, divers should not attempt to enter the vessel. The Chikuzen, a 246 ft refrigeration vessel belonging to the ﬁshing ﬂeet in St Maarten, had been impaired 2 years prior to being moored at the ﬁshing ﬂeet dock, where it was causing damage. As the owners wanted to stop further destruction, she was intentionally set ablaze off the docks, but she didn’t sink and eventually reached the BVI, threatening to beach on Marina Cay. She was taken under tow and eventually sank without issue. Surrounded now by miles of sand, this is the only place for marine life to congregate. Regular visitors include schooling barracuda, horse-eye jacks and snapper, stingrays, eagle rays, African pompano, Atlantic spadeﬁsh, nurse sharks and reef sharks along with a resident 600lb Goliath Grouper.